← Do Jet Streams Vanish with Arctic Sea-Ice? I teach you how (the layperson, or not) to draw the atmospheric circulation patterns of the Earth. All you need to know is that “hot air rises”, there are 3 main cells, and moving objects north of the equator turn to the right (opposite in the south). With this knowledge in your “toolkit”, you can better understand how the jet streams form, and how they change as the Arctic rapidly warms. Draw a MAP of Earth from memory. Practice until it is somewhat recognizable. On this map, I teach you how to draw the ocean currents around the planet, including surface water flows and seafloor flows. All you need to remember is that movement is deflected to the right in the northern hemisphere; opposite in the south. Also, that the Gulf Stream flows NE off the US east coast. Everything else flows naturally, including the location of the 5 main ocean gyres. I discuss how climate is changing these patterns. Recent full length interview on Extinction Radio, with Jennifer Hynes: ‘Extinction Radio Episode 69, 5th Apri 2017 – Dahr Jamail, Mike Silwa, Paul Beckwith.’ This is in Part Three, about one hour long. 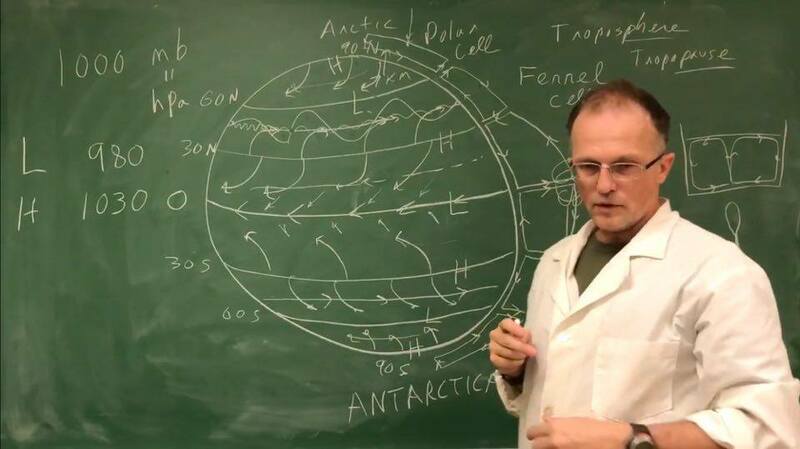 This entry was posted in New Video, Podcasts, Videos and tagged AMOC, Antarctica, Arctic, Arctic Temperature Amplification, Atlantic Meridional Overturning Circulation, Climate, Climate Change, Equator, Extinction Radio, Ferrel Cell, Global Warming, Gulf Stream, Hadley Cell, Jennifer Hynes, Jet Streams, Polar Cell, THC, Thermocline, z Halocline, z Inter-Tropical Convergence Zone, z ITCZ, z Kuroshio Current, z MOC, z Pycnocline, z Thermo-Haline Circulation. Bookmark the permalink. I would like to also ask of the correlation of the inertia mass of the atmosphere then at the equator being effected by the increased warming factoring methane hydrate and lift of the atmosphere effecting the ionosphere and ozone shielding. Any loss of O3? might you calculate?